Private Tax Collection: Will Congress Ever Learn? 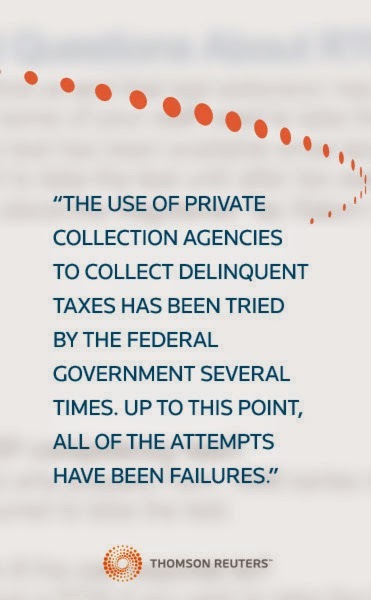 The use of private collection agencies to collect delinquent taxes has been tried by the federal government several times. Up to this point, all of the attempts have been failures. So why does Senator Charles E. Schumer (D-NY) want to use them again? Could he be politically motivated? Senator Schumer has had a provision inserted into the tax extenders bill that will require the IRS to contract with four private collection agencies to collect delinquent income taxes. Did I mention that two of those agencies are located in Senator Schumer’s congressional district? As I mentioned, we’ve been down this path before. The first attempt to collect delinquent taxes by someone other than the IRS was in 1872 when Congress authorized contracts between private citizens and the U.S. Treasury Department to collect delinquent taxes. The collectors were entitled to retain 50% of the amount they collected. The process lost money and generated so many complaints that it resulted in the resignation of William Adams Richardson, Secretary of the Treasury. Two other uses of private collection agencies were made in 1996 —1997 and 2006 — 2009. Both lost money and resulted in numerous consumer complaints. In one instance, private tax collection agencies collected approximately $98 million in delinquent taxes but it cost the Treasury over $110 million to administer the program. The Treasury Department also estimated that one of the programs would raise more than $1 billion in revenue, however the program ended up losing money. Based on past experiences with private tax collectors you’d think that Congress would have learned its lesson. Private tax collection services don’t work. In addition to being money-losing operations there are other reasons not to hire private debt collectors. have no incentive to help the taxpayer correct simple errors. I have a better solution that doesn’t require the services of a private debt collector. Why not just collect the $3.3 billion in back taxes owed by current and retired employees of the federal government? (http://money.cnn.com/2014/05/23/pf/taxes/federal-workers-delinquent-taxes/) After all, the IRS knows where they work, so why not set up an affordable payment plan and deduct it from their paychecks each pay period? The Internal Revenue Service (IRS) just couldn’t wait for Congress to pass legislation giving them the authority to regulate unregistered paid tax return preparers. 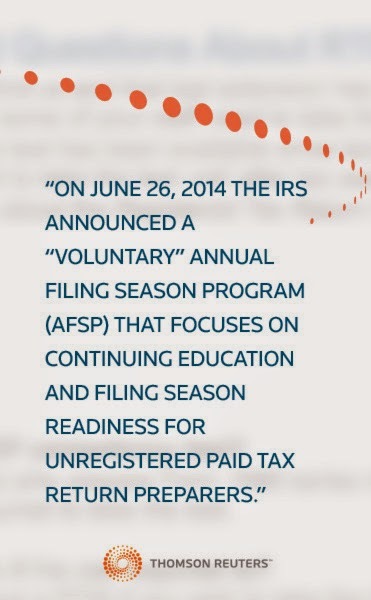 So, on June 26, 2014 the IRS announced a “voluntary” Annual Filing Season Program (AFSP) outlining the new program that focuses on continuing education and filing season readiness for unregistered paid tax return preparers. The AFSP program will allow unenrolled return preparers to obtain a record of completion when they voluntarily complete a required amount of continuing professional education, including courses in basic tax filing issues and updates, ethics, as well as other federal tax law matters. According to IRS Commissioner John Koskinen, “This voluntary program will be a step to help protect taxpayers during the 2015 filing season.” However, not everyone agrees with the commissioner. In fact, the AICPA calls the program unlawful and improper. I. The IRS must identify a statutory basis for any regulatory approach it creates. · No statutory authority, including 26 U.S.C. § 7803, authorizes the proposed program. · If the IRS cannot identify a clear, specific statutory basis for its action, then under the Administrative Procedures Act (APA) it may not act. II. A purportedly “voluntary” program would be an end-run around Loving vs. IRS. · The proposed program would also undermine the legal rationale given by the court in striking down the tax return preparer regulations. · The “voluntary” program would undermine the important concerns underlying Loving. III. The IRS must comply with procedural requirements. · The IRS must comply with the APA’s Notice and Comment procedures. · The IRS must comply with the Paperwork Reduction Act and with Executive Order 12,866 (Regulatory Planning and Review). IV. The proposal is arbitrary and capricious. · A voluntary program would not address the problem of unethical or fraudulent tax return preparers. · A voluntary program could give rise to confusion among consumers. · The IRS has not sufficiently considered alternative methods of ensuring that tax return preparers are qualified and competent. For a complete copy of the AICPA’s 14 page letter go to the following website: http://www.aicpa.org/Advocacy/Tax/DownloadableDocuments/AICPA-Letter-to-Comm-Koskinen-June-24-2014.pdf . I think the IRS is trying to do the right thing, but I believe that they are going about it in the wrong way. I agree with the AICPA that any approach the IRS takes must be supported by a strong legal basis and sound policy. To acquire that legal basis will require congressional intervention; however, Congress probably won’t act until after the next elections.